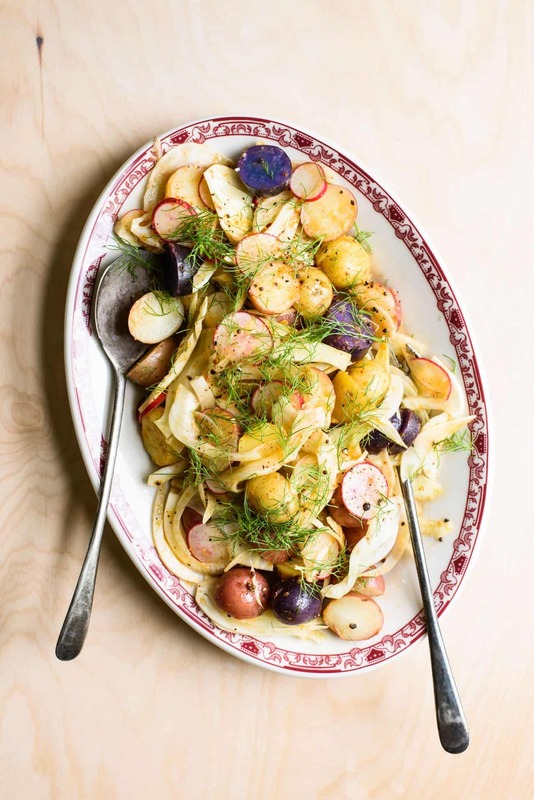 This summery mayo-less potato salad is inspired by Kismet, a trendy all-day cafe in Los Angeles. Last spring, Rene got to spend the semester in an art residency in Los Angeles. While I wouldn’t want to conduct my relationship on a bicoastal basis again, visiting my boyfriend in LA in April was a fun perk. And all the amazing meals we had there definitely softened the blow of a long-distance relationship… well, as much as they could, anyway. LA has been overshadowing NYC as the country’s best food city for a while now and last spring, it really felt like it had reached some sort of pinnacle. It’s safe to say I had all my can’t-miss restaurants mapped out long before I boarded the flight. Our first stop was Djelina for pizza and the best smoked trout-citrus salad I’ve ever had. Then there was day-drinking at Manuela at Hauser & Wirth; the garlic-roasted chicken on jus-soaked bread at Petit Trois that I still can’t get out of my head; juicy roadside taco truck tacos, of course; Madcapra’s falafel sandwich with pickled fennel; and last but definitely not least, brunch at Kismet. 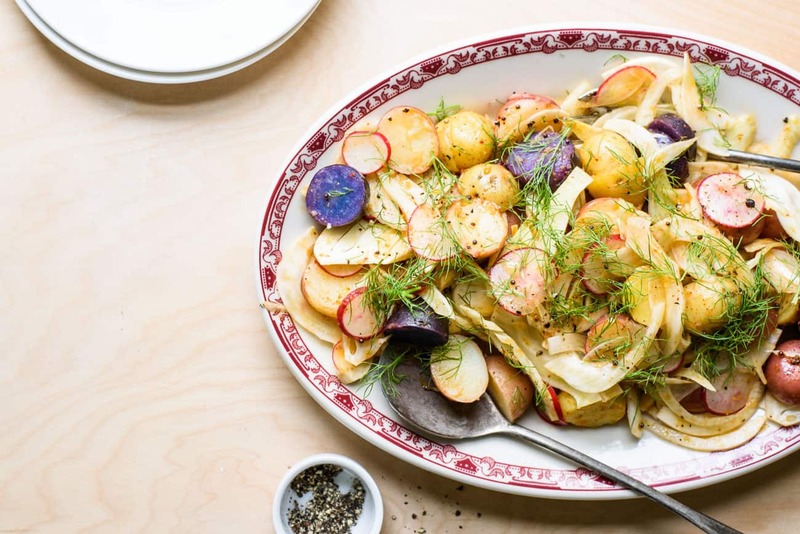 It consisted of fingerling potatoes, paper-thin radishes and fennel, dill, mustard seeds, and spicy dressing – it was just bursting with spring flavors. The salad was filling yet light, and I loved the interaction of the chewy potatoes with the crunchy raw veg and grassy dill. Most notably, though, there was a distinct lack of mayo. I don’t know about you, but having been practically force-fed Russian mayo-laden, mushy potato salad (Salat Oliviye) most of my life, I gravitate way more toward lighter, crunchier versions dressed in vinaigrette instead. -And finish with lots of freshly cracked black pepper. 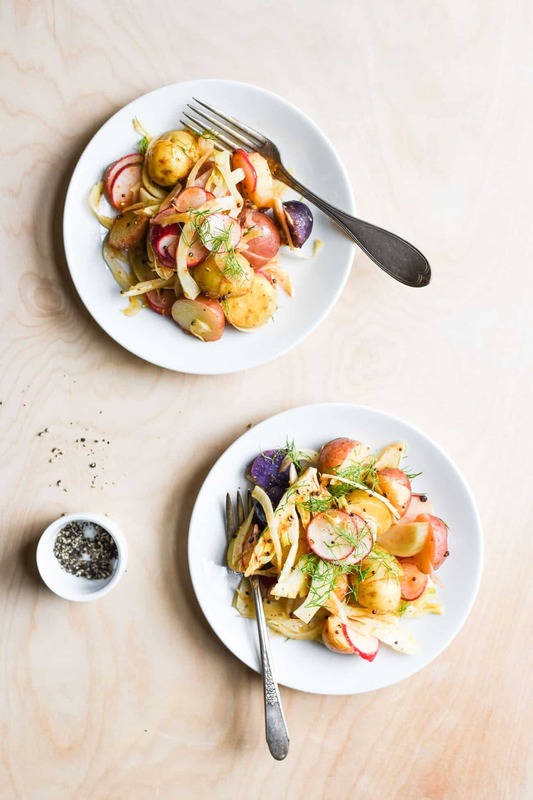 This summery mayo-less potato salad (inspired by LA restaurant Kismet) features fresh, crunchy vegetables and a simple homemade vinaigrette. Place the potatoes and salt in a medium pot and add enough water to cover by about 2 inches. Cover with a lid and bring to a boil. Reduce the heat to low and simmer with the lid ajar until the potatoes are just fork-tender, about 12 minutes. Drain and let cool a little. Meanwhile, make the Dressing: If using mustard seeds, add the oil and mustard seeds to a small skillet and place over medium heat. Heat until the seeds start to sizzle gently, 1 to 2 minutes. Immediately scrape the mixture into a large bowl. Add the lemon zest and juice, curry paste, garlic, salt, and pepper and stir to combine. If not using mustard seeds, simply combine all the dressing ingredients in a large bowl. Taste the dressing and adjust seasonings, if needed. When the potatoes are cool enough to handle, halve them and add to the bowl with the dressing. 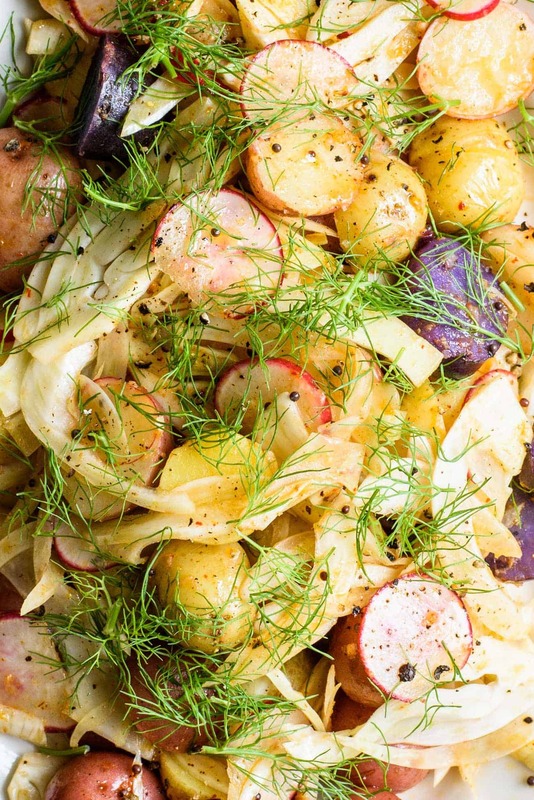 Add the fennel and radishes and gently toss to combine. Taste and adjust seasonings, if needed. 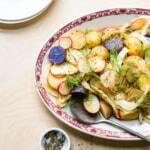 To serve, transfer the salad to a serving platter and garnish with the fennel fronds. Mustard seeds are common in Indian cooking. They add a toasty, bitter flavor and crunch to this salad. You can buy them in many supermarkets, Indian/Asian specialty markets, or online. If you don’t have them, feel free to leave them out. Is potato salad really a salad? I don’t care cause it’s so darn delicious!